Definition: Strategic Intent can be understood as the philosophical base of strategic management process. It implies the purpose, which an organization endeavor of achieving. It is a statement, that provides a perspective of the means, which will lead the organization, reach the vision in the long run. Strategic intent gives an idea of what the organization desires to attain in future. It answers the question what the organization strives or stands for? It indicates the long-term market position, which the organization desires to create or occupy and the opportunity for exploring new possibilities. Vision: Vision implies the blueprint of the company’s future position. It describes where the organization wants to land. It is the dream of the business and an inspiration, base for the planning process. It depicts the company’s aspirations for the business and provides a peep of what the organization would like to become in future. Every single component of the organization is required to follow its vision. Mission: Mission delineates the firm’s business, its goals and ways to reach the goals. It explains the reason for the existence of business. It is designed to help potential shareholders and investors understand the purpose of the company. A mission statement helps to identify, ‘what business the company undertakes.’ It defines the present capabilities, activities, customer focus and business makeup. Business Definition: It seeks to explain the business undertaken by the firm, with respect to the customer needs, target audience, and alternative technologies. With the help of business definition, one can ascertain the strategic business choices. The corporate restructuring also depends upon the business definition. Business Model: Business model, as the name implies is a strategy for the effective operation of the business, ascertaining sources of income, desired customer base, and financing details. Rival firms, operating in the same industry relies on the different business model due to their strategic choice. Goals and Objectives: These are the base of measurement. Goals are the end results, that the organization attempts to achieve. On the other hand, objectives are time-based measurable actions, which help in the accomplishment of goals. These are the end results which are to be attained with the help of an overall plan, over the particular period. 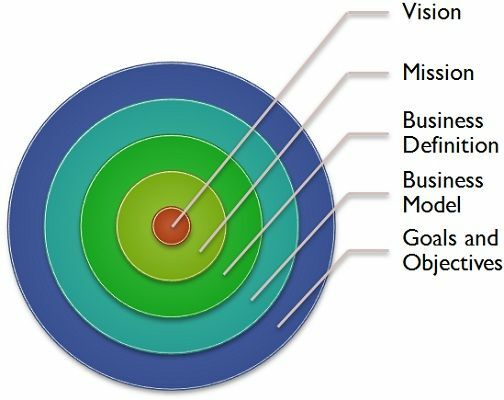 The vision, mission, business definition, and business model explains the philosophy of business but the goals and objectives are established with the purpose of achieving them. Strategic Intent is extremely important for the future growth and success of the enterprise, irrespective of its size and nature.